A Cass Business School MSc student has scooped the prestigious 2017 SCOR UK Actuarial Prize for the best academic paper in the field of actuarial science. This year's prize was awarded to Luo Pengziwei for her MSc dissertation Credibility balanced Bias vs. Instability trade-off within Double Chain Ladder. Luo was invited to the SCOR Annual Chairman's Dinner in Trinity House, Tower Hill, London to receive her prize and grant of £3,000. She said she was delighted to receive the prize. 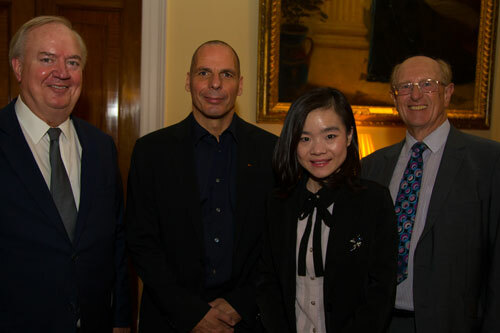 L-R: Chairman and CEO of SCOR SE Denis Kessler; Yanis Varoufakis; Luo Pengziwei; and Professor Christopher Daykin, Honorary Visiting Professor, Cass. Luo’s supervisor, Dr Jens Perch Nielsen said Luo’s thesis was a particularly interesting piece of research delivered at a very high level for a master thesis student. “Luo was an unusually enthusiastic and hardworking young woman when writing her master thesis. She managed to have a productive dialogue – not only with me – but also with some of the other major co-authors and inventors of the Double-Chain-Ladder framework. Find out more about MSc programmes at Cass here.